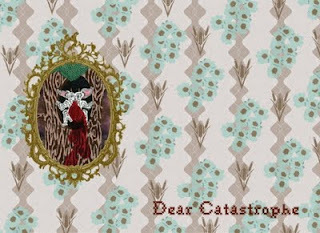 Stephanie Mansolf's "Dear Catastrophe" will run from November 8-29, 2009. Organized by Dodie Bellamy, "Dear Catastrophe" presents a series of Victorian styled treehouse dioramas - an imaginary cityscape - inhabited by humans, gremlins, and warrior cupids. Spike pits are layered in front of the treehouses, mountains behind the treehouses, clouds with battling cupids above the treehouses. In this layered landscape Mansolf explores how a space created for safety can quickly and easily become a threat. The treehouse city is inherently precarious, and its denizens are quickly falling into a chaos of disarray, danger, destruction, and death. Mansolf's startling dystopia draws on influences as disparate as the video game Mortal Kombat, the 1960's Disney film Swiss Family Robinson, and San Francisco's "painted ladies," the Victorian homes that adorn our streets. Stephanie Mansolf received her BFA from UC Santa Barbara in 2006. During the end of her undergraduate studies Mansolf was commissioned in conjunction with artist Kat Trajano to transform Santa Barbara's chic Presidio Motel into an avant garde and eclectic art motel; a project from which the duo has received wide acclaim. Since then Mansolf has shown in Santa Barbara, San Francisco and Arcata California. Mansolf's practice delves into dark angles between reality and fantasy, investigating matters of human nature, disease, and hybridity through a manifestation of fanciful imagery. Employing gothic and surreal aesthetics, Mansolf creates a carnivalesque landscape where melodrama thrives, and taboo topics can be explored. She currently lives and works in San Francisco California.